The name for this resin possibly comes from “incense of Franks” since it was reintroduced to Europe by Frankish Crusaders. milky sap tapped from the Boswellia tree. Some have also postulatedthat the name comes from the Arabic term for “Oil of Lebanon” since Lebanon was the place where the resin was sold and traded with Europeans. Compare with Exodus 30:34, where it is clearly named levonah, meaning either “white” or “Lebanese” in Hebrew. The lost city of Ubar,sometimes identified with Irem in what is now the town of Shisr in Oman, is believed to have been a centre of the frankincense trade along the recently rediscovered “Incense Road”. Ubar was rediscovered in the early 1990s and is now under archaeological excavation. The Greek historian Herodotus was familiar with Frankincense and knew it was harvested from trees in southern Arabia. He goes on to describe the method used by the the Arabians to get around this problem, that being the burning of the gum of the styrax tree whose smoke would drive the snakes away. Frankincense trees in Dhufar, OmanFrankincense is used in perfumery and aromatherapy. Olibanum essential oil is obtained by steam distillation of the dry resin. The smell of the olibanum smoke is due to the products of pyrolysis. 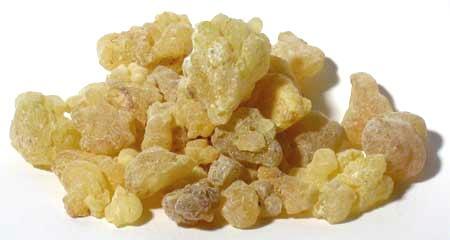 Frankincense was lavishly used in religious rites. In the Bible’s Old Testament, it was part of the temple rites; according to the Gospel of Matthew 2:11, gold, frankincense and myrrh were among the gifts to Jesus by the Biblical Magi “from out of the east”. The Egyptians ground the charred resin into a powder called kohl. Kohl was used to make the distinctiveblack eyeliner seen on so many figures in Egyptian art. The aroma of frankincense is said to represent life and the Judaic, Christian and Islamic faiths have often used frankincense mixed with oils to anoint newborn infants and individuals considered to be moving into a new phase in their spiritual lives. The growth of Christianity, with an initial deritualisation of religion later to be reverted, depressed the market for frankincense during the 4th century AD. Desertification made the caravan routes across the Rub al Khali or “Empty Quarter” of Arabia more difficult. Additionally, increased raiding by the nomadic Parthians in the Near East caused the frankincense trade to dry up after about AD 300. Our fine resin incense is packed in a stay-fresh spice jar. It contains a generous 1 oz. portion of resin and is the finest, most select quality available on the import market. 1. Only use a fireproof container. A metal bowl on a plate works well. You can also use a censer, urn or burner made for this purpose. Make sure not to over fill the container. A small amount of quality resin goes along way. 2. Light a charcoal tablet using tongs or a screen holder. Most charcoal tablets have special ingredients to help the charcoal light fast. Make sure the charcoal tablet it fully ambered before placing it into your burner. 3. Sprinkle small amounts of crushed of broken resin chunks onto the charcoal. Not to much, allowing the resin to breath. Enjoy.